The country’s tourism industry performance is off to a thriving start this year and continues to break records with the month of February 2016 reaching a total of 549,725 visitors for a double-digit increase of 20.42% from 2015. In the past 62 months under the Aquino Administration, this has been the highest growth rate and the biggest volume of visitor arrivals. For two consecutive months, the country’s tourism grew by double digits at 13.17 percent in January and 20.42 percent in February. Total number of inbound visitors recorded from January – February 2016 is already at 1,091,983 or a 16.71% growth from the same period in 2015 and surpassing 1M visitor arrivals in just 2 months. By regional grouping, East Asia is the country’s biggest source of arrivals with 565,971, constituting more than half of the total visitor volume. Korea continues to supply the biggest arrivals to the country with a total of 284,763 arrivals. This market accounted for 26.08 percent which is more than one fourth of the total arrivals. Except for Hong Kong, all countries from the East Asian markets posted increases, with China reflecting the biggest growth of 107.88 percent from its arrivals of 62,976 in 2015 to 130,916 this year. Another high growth market is Taiwan which posted an increase of 30.89 percent. The United States of America ranked as the 2nd visitor-generating market with 155, 796 visitors, constituting 14.27 percent of the total and recording a 9.54 percent increase from its arrivals of 142,226 in the same period of 2015. China which provided 130,916 visitors secured the 3rd spot, with a 11.99 percent share to the total. Japan followed by contributing 92,531 visitors, comprising 8.47 percent of the total inbound traffic. The 5th major market was Australia with 43,712 arrivals, comprising 4.00 percent of the total. Rounding up the top ten visitor markets are Canada (+18.36%) with 36,773 arrivals, T aiwan (+30.89%) with 35,344 arrivals, Singapore (+4.04) with 28,376 arrivals, United Kingdom (+20.98%) with 28,238 arrivals, and Malaysia (+2.33%) with 23,990 arrivals. Countries which also posted substantial growth in inbound traffic to the Philippines in January and February 2016 include France with 12,502 (+22.10%), Spain with 5,092 arrivals (+32.23%), Sweden with 7,073 arrivals (+21.09%), Indonesia with 8,824 arrivals (+16.66%), Switzerland with 6,494 arrivals (+17.09%), Netherlands with 6,049 arrivals (+13.83%), and New Zealand (+13.55%) with 3,294 arrivals. Visitor Receipts. 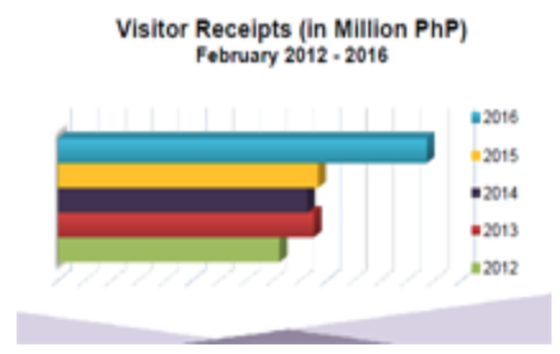 Tourism activities for the month of February 2016 generated an estimated earnings of Php 27.49 billion which posted a growth of 42.09% from the earnings of February 2015 amounting to Php 19.35 billion. Among the top twelve markets of the country, visitors from Korea also recorded the highest per capita spending for February 2016 with Php 93,860.46 while visitors from Germany provided the second largest per capita spending of Php 69,603.98. 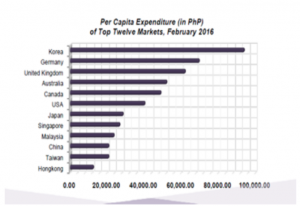 United Kingdom ranked third with per capita spending of Php 62,092.63. Other top markets with high per capita spending include Australia with Php 52,081.82, Canada with Php 48,944.86 and U.S.A. with Php 40,302.14.